Holyoke — James F. Murphy, 74, a true Holyoker loved by many, passed away peacefully on Tuesday, November 20, 2018 with his beloved family by his side. A son of the late George and Madeleine Murphy, he leaves his beloved wife of 54 years Dianne E. (Mahoney) Murphy of Holyoke and eight children Mary (Jeff) Brazeau, Amy (David) Skrzyniarz, Roseanne (Jerry) Caracciolo, Joan (Jim Gavron) Murphy, Peggy (Jason) Garand, Rev. James Murphy Jr. CSB, Emily (Matthew) McArdle, and Sheila (Jenkin) Gould; 31 grandchildren; and 3 great-grandchildren. He also leaves brothers, George, Edward, Robert, Stephen, Timothy and dear sister, Ann Marie Novak; along with aunts, uncles, cousins, nieces, nephews and too many friends to name but never too many to hug. Born in Holyoke and raised in South Hadley. When his family moved to Woonsocket RI he met his high school sweetheart Dee, they graduated in 1961 and married in 1964. Their married life began in Holyoke…the beginning of true Holyokers. He was employed at Sinclair Wire Company, and then worked as a Quality Control Analyst for Technifax Corporation, Scott Graphics, Xidex, Graph Coat, Cookson Graphics, International Paper and Kodak Polychrome where he “retired”. After his retirement, he was gainfully employed as a driver for the Holyoke Council on Aging, where once again, he “retired”. To stay busy during his retirement, he began working for Messier Brunelle Funeral Homes until his death. Jim did not just work and raise his family, he was active in his parish, the City of Holyoke, and the greater Western Massachusetts community. He has been a member of Holy Cross Parish, now Our Lady of the Cross Parish for 54 years. He served as an usher, Eucharistic Minister, Parish Council, Mater Dolorosa Spaghetti Supper, the Parish Festival along with many other parish community activities not limited to his 30 plus years as a CCD teacher, where he was awarded the Pope Pius X award. His love of his faith and service began when he was 17 attending annual weekend retreats at the Mother of Sorrows Retreat House in West Springfield. He was an active member of the Cursillo Community of Western Massachusetts for 44 years. He served on many teams, and also served as a Rector and was a Spiritual Director for a number teams. Through Cursillo he learned to better serve God and the community. 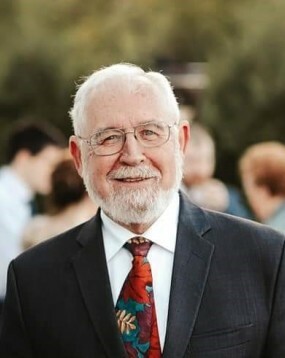 He was a member of the Hibernians, a Third Degree Knight of Knights Columbus Council 90, and most recently the Connecticut Valley Mineral Club. He was also a devoted donor with the American Red Cross, most recently as a platelet donor. He loved to fish, whether fly fishing or rod and reel. It didn’t matter if he caught a fish or not, it was learning all the streams in Western Massachusetts and sharing this passion with his family. He also loved the Red Sox, the Bruins, the Celtics and the Patriots, not necessarily in that order. He enjoyed a good book, always carrying one with him. He shared his love of music with his family, playing the guitar for his children when they were little and was always ready to sing a song and dance at a party. He would attend any event to see his beloved grandchildren in whatever activity they were involved in; a very good Poppa. Jim and Dee could often be spotted at the Ninety Nine on Tuesday nights in West Springfield or Donovan’s Pub on a Friday night. The shared thoughts of a beloved friend wrote…He was a true gentleman, and the living example of what and who a father should be. He loved all and shared that love, simply and unconditionally. Friends and family are invited to gather for the Liturgy of Christian Burial on Saturday, November 24, 2018 at 10:00 AM at Our Lady of the Cross Church, Holy Cross Avenue, Holyoke, MA. The burial will follow in St. Jerome Cemetery, Holyoke. Calling hours are Friday, November 23, 2018 at Messier Funeral Home, 1944 Northampton St., Holyoke, from 3-8 PM. In lieu of flowers, please make a donation in Jim’s name to St. Jude Children’s Hospital, Attn: Memorials and Honor Program, 501 St. Jude Place, Memphis, TN 38105 and The American Red Cross, 150 Brookdale Dr., Springfield, MA 01104. Please visit www.messierfuneralhome.com for more details.